Wow! Anko has just dropped a bomb in the Store! 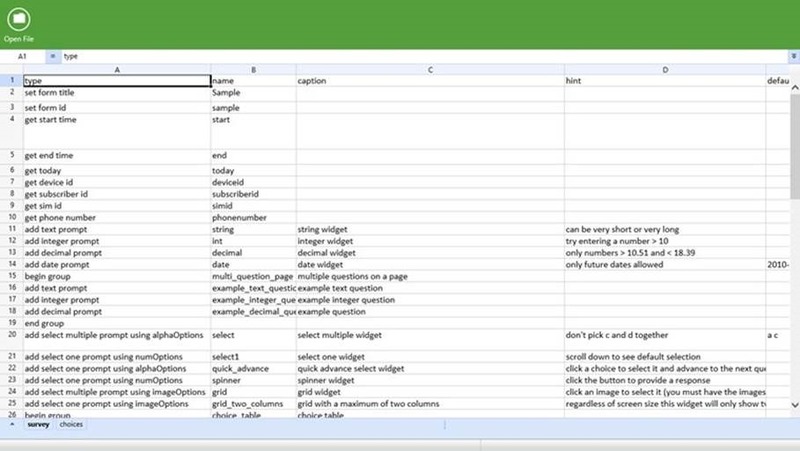 Just last week I was imploring a Dev to work further on his Excel Sheet viewer because it was too basic, you can only view basic information, no Cell titles, no expansion of columns, no support for graphs etc, etc. Well, Anko Software, known for their Windows Phone and Windows 8 Apps has just blown everyone away with this release of Excel+ App. I wrote then that we are happy to see Devs attempting to Metrofy Office Apps. That anything to keep us away from the Desktop is a welcomed addition on our Mobile Devices. The Desktop is power drain on a tablet. The Apps that run there aren’t optimized for power-sipping. They are power hogs! By running purely in the Metro environment, you can be sure of extended Battery-life. Therefore if all I want is just to peek an Excel file, why do I have to drop to the desktop to open Excel if I can just open simple MX App that does this. So, Excel worksheets is just the beginning, we are gunning for an MX Word Viewer too, and why not throw in an MX Powerpoint Viewer too. All these will get us on-track till Microsoft is finished porting Office to the MX environment. So, Go Anko! Go Devs! Dazzle us with what you can achieve in the MX environment. Prove the MX detractors that they are wrong. That you can also be productive in the Metro environment. 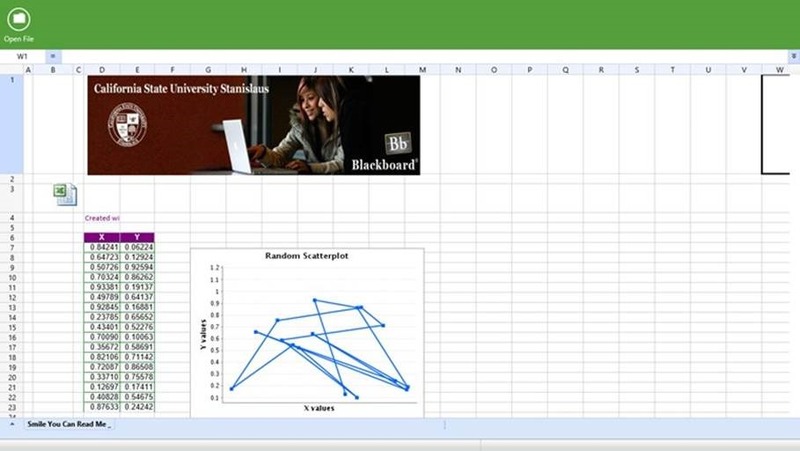 Excel + is an application for reliably viewing and interacting with Excel documents across platforms and devices. 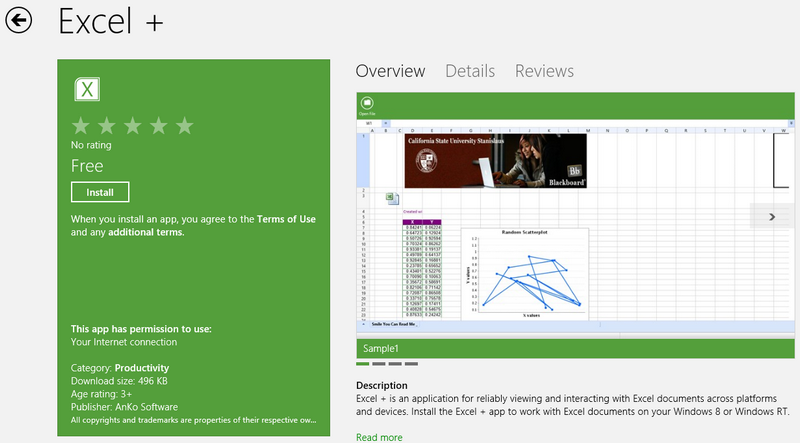 Install the Excel + app to work with Excel documents on your Windows 8 or Windows RT. 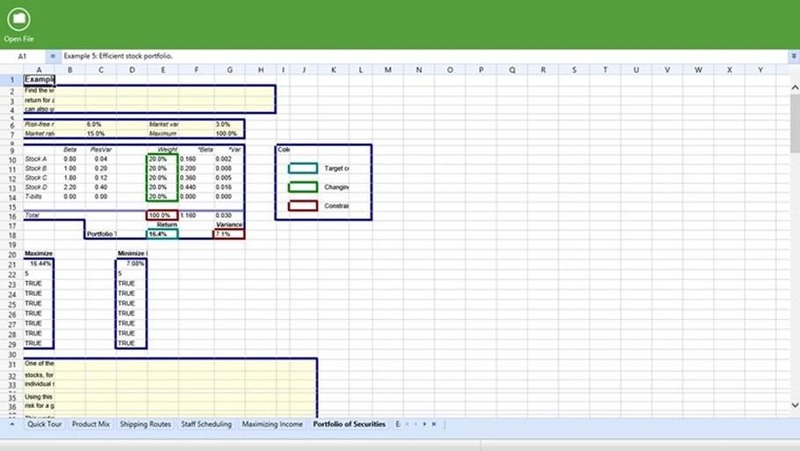 Microsoft Excel has the basic features of all spreadsheets, using a grid of cells arranged in numbered rows and letter-named columns to organize data manipulations like arithmetic operations. It has a battery of supplied functions to answer statistical, engineering and financial needs. In addition, it can display data as line graphs, histograms and charts, and with a very limited three-dimensional graphical display. It allows sectioning of data to view its dependencies on various factors for different perspectives (using pivot tables and the scenario manager).It has a programming aspect, Visual Basic for Applications, allowing the user to employ a wide variety of numerical methods, for example, for solving differential equations of mathematical physics, and then reporting the results back to the spreadsheet. It also has a variety of interactive features allowing user interfaces that can completely hide the spreadsheet from the user, so the spreadsheet presents itself as a so-called application, or decision support system (DSS), via a custom-designed user interface, for example, a stock analyzer, or in general, as a design tool that asks the user questions and provides answers and reports. 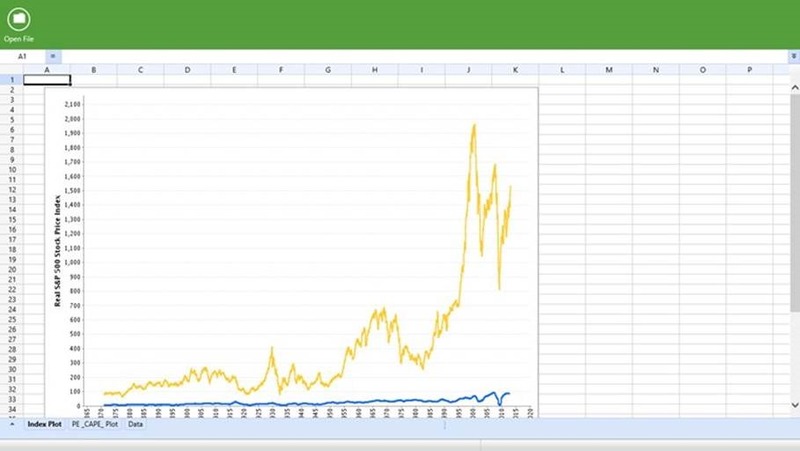 In a more elaborate realization, an Excel application can automatically poll external databases and measuring instruments using an update schedule, analyze the results, make a Word report or Power Point slide show, and e-mail these presentations on a regular basis to a list of participants. Previous Previous post: AppSwitch Updates in the Store with more Features! AFAIK, they are known for wrapping web apps into browser control and publishing as their own apps. IMO, they are uploading your file to some service like skydrive/google docs and then opening from there inside a webbrowser control. Ofcourse, if they are not asking for your credentials then they are using their own credentials which means all the user documents would get uploaded in their own account. I bet their app wont work without internet connection and I would advise not to trust this app with your private data. Wow, I am not aware of this. I will investigate further. People heed the warning for now. Do not use for the time being. Also, see my ComponentOne Excel Viewer App in the Store which I blogged about. The app is more responsive than this one from Anko, and ComponentOne is a trusted Software vendor. Have you ever used zoho.com for excel. basically anko software is uploading ur excel file on zoho.com & showing u web-link. Got it ? Btw.. To hell with privacy. right ? Thanks mate! Please see my response here above. I regret posting this really.